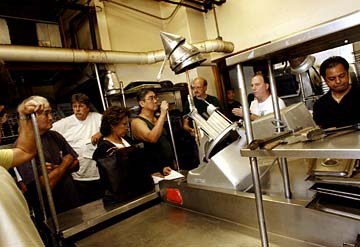 Marty McClain auctioned the Columbia Inn's kitchen fixtures, appliances and wares yesterday in Kaimuki. After its closure last month, the booths, appliances and cookware at the Kaimuki Columbia Inn were sold off to live again in other restaurants. The beige booth overlooking the parking lot is moving to Waikiki. The greased stove, cooking grill and toaster will be cleaned, polished and sold, as will the large pots, which once held gallons of the restaurant's famous oxtail soup. Yesterday's auction, which attracted mostly people in the restaurant business, provided clues to last month's sudden shutdown of the popular eatery on Waialae Avenue. Money from the sale, estimated at a few thousand dollars, will go to the Internal Revenue Service to make up for "a substantial" amount of delinquent taxes, said Marty McClain of McClain Auctions. "It's not going to cover even close to what they owe," said McClain, who was contacted by the IRS. District Court records show that the operators of the restaurant, Thanh and Tri Nguyen of NuSwiss LLC, were evicted from the Kaimuki Shopping Center after failing to pay the landlord more than $34,000 in overdue rent. The center sued NuSwiss twice in the past three years for falling behind the $12,950 monthly rent. The Nguyens, listed as defendants, were ordered to pay $10,989.47 in December 2004 and another $34,273.43 in August 2006, according to court documents. Phone messages left at numbers listed for Thanh and Tri Nguyen were not returned. 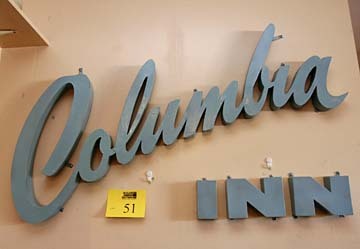 The Columbia Inn restaurant sign was one of 65 lots up for auction. NuSwiss' lease for the restaurant lasted until April 2020. According to the original contract, monthly rent went from $10,000 in 2001 to the current $12,950, and was scheduled to reach $15,000 next year. Ed Sulliban, property manager for the Kaimuki Shopping Center, said the next tenant will not be a restaurant. The Columbia Inn, which had about 5,000 square feet of space on the shopping center's second floor, had a history of cracked floors and water leaking into the business below, Sulliban said. The shopping center is now negotiating with "a couple" of interested retailers to move into the vacant space, Sulliban said. Customers of the popular family restaurant were stunned to find two "Restaurant Closed" signs posted on the Columbia Inn's glass door on March 14. Without much detail , the one-page note said the business had closed three days earlier after unsuccessfully trying to negotiate a deal with its landlord. The landlord, the sign added, also refused a signed offer from a chain willing to run the restaurant and keep most of its 50-plus employees. The restaurant's demise came more than six years after the Columbia Inn closed its Kapiolani Boulevard store, which had been in business for 37 years. Considered a true family restaurant, it was known for having a diverse menu with large portions served at a reasonable price, including dishes like oxtail soup and all-you-can-eat pancakes. At yesterday's auction, Waikiki businessman Sunny Lewis, who would often eat breakfast and "talk stories" at the restaurant, paid $100 for two sitting booths he will put in his store. Bob Lancaster, owner of Breakers Restaurant and Bar in Haleiwa, said the cost of running a restaurant in Hawaii is extremely high. "It's tough," said Lancaster, who bought a compartment sink and some appliances at the auction. Alan Casupang, who in 1999 bought the franchise's name and recipes from the Columbia Inn's former owner, said he is looking for an investor to build another restaurant. "The hard part is coming up with $2 (million) to $3 million dollars to restart the restaurant," he said. "That's really difficult."